Sarah Josepha Buell Hale (October 24, 1788 – April 30, 1879) was an American writer and an influential editor. She was the author of the nursery rhyme "Mary Had a Little Lamb". Hale famously campaigned for the creation of the American holiday known as Thanksgiving, and for the completion of the Bunker Hill Monument. Hale may be the individual most responsible for making Thanksgiving a national holiday in the United States; it had previously been celebrated mostly in New England. Each state scheduled its own holiday, some as early as October and others as late as January; it was largely unknown in the American South. Her advocacy for the national holiday began in 1846 and lasted 17 years before it was successful. 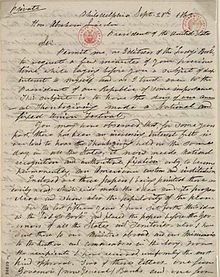 In support of the proposed national holiday, Hale wrote letters to five Presidents of the United States: Zachary Taylor, Millard Fillmore, Franklin Pierce, James Buchanan, and Abraham Lincoln. Her initial letters failed to persuade, but the letter she wrote to Lincoln convinced him to support legislation establishing a national holiday of Thanksgiving in 1863. The new national holiday was considered a unifying day after the stress of the American Civil War. Before Thanksgiving's addition, the only national holidays celebrated in the United States were Washington's Birthday and Independence Day. Hale also worked to preserve George Washington's Mount Vernon plantation, as a symbol of patriotism that both the Northern and Southern United States could all support. Hale raised $30,000 in Boston for the completion of the Bunker Hill Monument. When construction stalled, Hale asked her readers to donate a dollar each and also organized a week-long craft fair at Quincy Market. Described as "'Oprah and Martha Stewart combined,'" Hale's organization of the giant craft fair at Quincy Market "was much more than a 'bake sale'"—"refreshments were sold ... but they brought in only a fraction of the profit." The fair sold handmade jewelry, quilts, baskets, jams, jellies, cakes, pies, and autographed letters from Washington, James Madison, and the Marquis de Lafayette. Hale "made sure the 221-foot obelisk that commemorates the battle of Bunker Hill got built."